Não é novidade nenhuma que sou completamente apaixonada por anéis. Uma das razões pela qual eu adoro aneís é porque todos eles têm uma história por trás. Este anel turquesa comprei-o numa das minhas visitas a Lisboa. O anel que vêm no meio do dedo (mais conhecido como anel falange) é um dos meus anéis mais recentes. Já andava à procura de um há imenso tempo e por isso comprei logo dois, este e um outro completamente diferente, que mostrarei noutro dia. There's not new that I'm completely obsessed with rings. One of the reasons why I love rings so much it's because they all have a story behind. 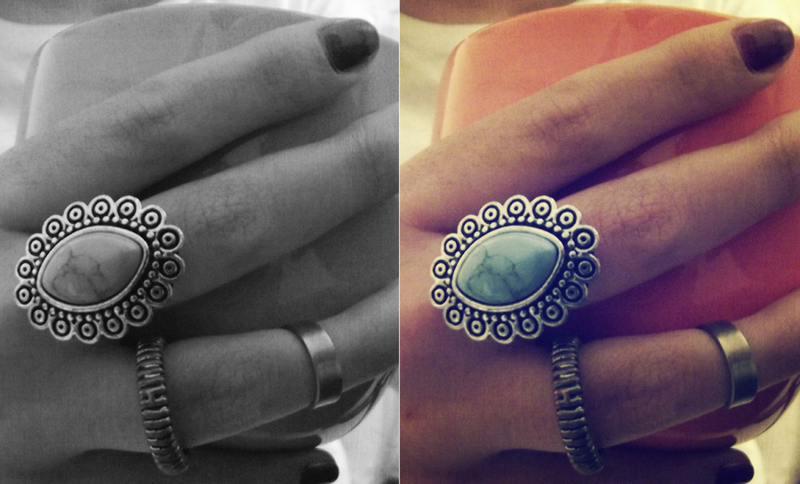 This turquoise ring was bought in one of my trips to Lisbon. The ring that you see in the middle finger (better known as phalanx ring) is one of my newer rings. I was looking for one for a long time so when I found it I bought two, this one and another one completely different that I will show you in another day.